Home Apple iPhone Why Don’t I Have an “On My iPhone” Folder in iOS 9 Notes? The Notes app received some improvements and upgrades with the iOS 9 software update, including the ability to create checklists, draw, add pictures, and more. Notes with these new features are only available, however, when you are saving notes to your iCloud account, or to your device. But you may have opened the Notes app after updating to iOS 9 and switching to the new version of Notes, only to find that you did not have an option to save to the ‘On My iPhone” folder. 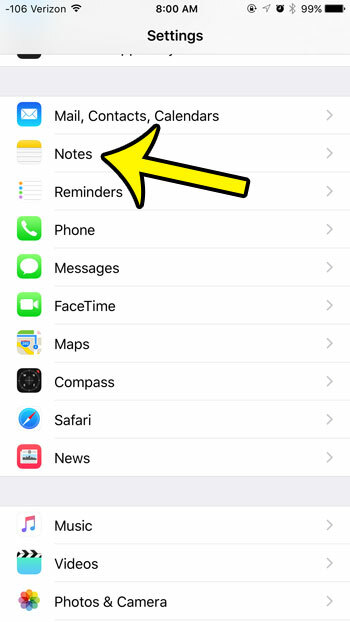 Saving notes directly to your iPhone is an option that can be turned on or off in the settings menu for the Notes app. 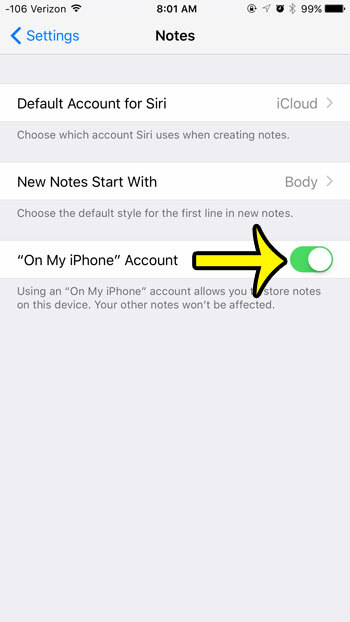 The guide in this article will show you where to find this setting so that you can enable it and save new notes to your device. The steps below will assume that you are running at least iOS 9, and that you have already updated to the new version of notes that comes with iOS 9. You can check your version of iOS to confirm that. 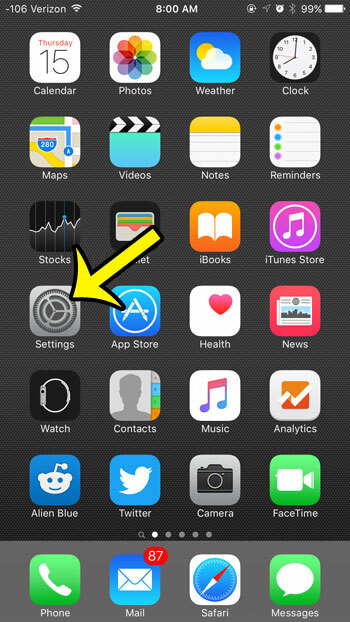 If you are using iOS 9, then you can update to iOS 9 Notes by simply opening the app and following the steps onscreen. Scroll down and select the Notes option. Tap the button to the right of “On My iPhone” Account to turn it on. You will know that it is turned on when the shading around the button is green, and the button is in the rightmost position. The setting is turned on in the image below. You can now open the Notes and and start creating folders and notes that are saved directly to your device, instead of to an iCloud or mail account. Do you use the Siri feature on your iPhone a lot, but would prefer either a different gender or accent for the voice? You can change Siri’s voice in iOS 9 to either a male or female voice, and you can select from several different accents. How Can I Remove the Header Area in Google Docs?